Copyright: © 2016 Hedayat N, et al. This is an open-access article distributed under the terms of the Creative Commons Attribution License, which permits unrestricted use, distribution, and reproduction in any medium, provided the original author and source are credited. Flixweed (Descurainia Sophia L.) seeds, known as an herbal medicine, for the first time are used as a promising pore-forming agent (pore-former) in ceramic technology. Flixweed seeds were selected because of their unique constant shape (oblong, 1.2 mm long with the aspect ratio of about 2) and narrow size distribution as well as their low-cost. Porous zirconia ceramics have been fabricated using flixweed seeds by tape casting technique. The dried tape-cast cut into disk-shaped pieces and were fired at 1400°C for 2h, resulting in porous zirconia disks with a bulk density of 3.96 g/cm3, total porosity of 34.6 ± 0.9% (open porosity 25.5 ± 0.7%, closed porosity 9.1 ± 0.3%) and a linear shrinkage of 21.5 ± 0.3%. The pore shape and size were similar in shape and size to the original pore-former. Porous ceramics are used for an ever-expanding range of applications in bone tissue engineering, membrane separation, and catalytic reactors. Different applications of porous ceramics have been described in a book edited by Scheffler and Colombo . A number of processing routes are used to prepare porous ceramics including partial sintering , gel casting , sol-gel technique , dry foaming method , and the incorporation of pyrolizable pore-forming agents (poreformers) that burn out during firing. Various types of pyrolizabale pore-formers have been examined as sacrificial templates or fugitive materials to obtain the different shape and size of pores [6-11]. The pyrolizable pore-formers have behaved as template in forming the pores that correspond closely to the shape and size of original pore-former . The number and nature of the pores (open pores and closed pores) can be determined by the combination of characterization techniques including Archimedes method, scanning electron microscopy (SEM) imaging, optical microscopy, focused ion beam (FIB)-SEM studies, mercury porosimetry, and gas permeability tests . Flixweed (Descurainia sophia L.) seeds, a known medical herb commonly used in traditional medicine , is one of the most abundant weeds in North America and China . Felixweed seed is very small, dark yellow or brown, possess an uneven surface in a stretched oval form, one end of which is cut and maintains a transparent yellowish ring . Flixweed seeds might be a potentially interesting and unique pore-former for ceramics, and there is no report so far on the use of flixweed seeds as a pore-former in ceramic fabrication. In the present study, we report the first results on the use of flixweed seeds to fabricate porous ceramics. A composite pore-former containing microcrystalline cellulose and flixweed seeds together used to generate zirconia ceramic with a hierarchical porosity including small and large pores derived from the burnout of microcrystalline cellulose and flixweed seeds. Cellulose as a natural pore-former has a number of advantages including easy availability and processing (narrow decomposition temperature range of 300-350°C), and lowcost . Alumina ceramics prepared using poppy seeds [14,25], and commercially milled coffee  are compared to the samples fabricated using flixweed seeds by tape casting. Flixweed seeds were purchased from Sadaf (Soofer Co., Inc., USA), and microcrystalline cellulose (PH-301) was provided by FMC BioPolymer, USA. TZ-3Y powder was obtained from Tosoh, Japan. Methyl ethyl Ketone (MEK, ≥99.0%) and polyethylene glycol (PEG 200) were purchased from Sigma-Aldrich. Hypermer KD-1, Butvar (polyvinyl butyral (PVB), B-98) and Ethanol (94-96%) were prepared form Tape Casting Warehouse, Inc., USA, Solutia, Inc., and Alfa Aesar, respectively. A lab roll ball mill (Tencan, Model No. : QM-5, China) using yttria stabilized zirconia (YSZ) cylinders as milling media (5×5 mm, Inframat Advanced Materials) was used for the ball milling of slurry. Tape casting was performed using a Lab scale tape caster (Richard E. Mistler, Inc.), in which slurry was cast onto a polyethylene carrier film (Mylar sheet). A muffle furnace (Across International, NJ) was used for the firing of samples. The S-2600N scanning electron microscope that was used to take the SEM images is from Hitachi, Japan. In the present study, tape casting (TC) or doctor blade process that is a low-cost and simple method to fabricate thin flat sheets of ceramics was used. 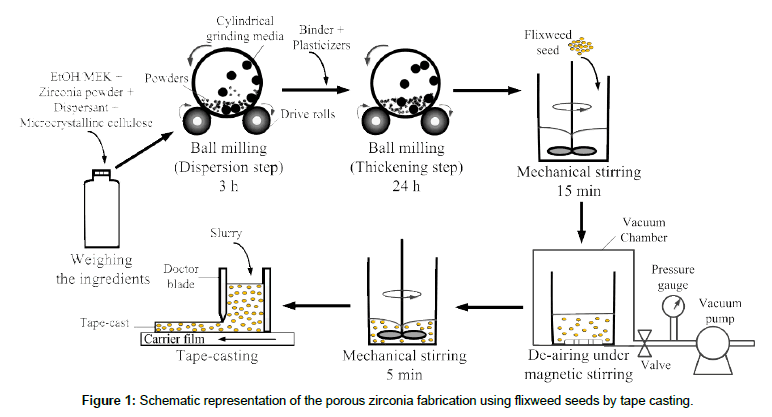 Figure 1 depicts a schematic representation of fabricating porous zirconia ceramic using flixweed seeds by tape casting. Zirconia tape was produced by tape casting of the slip that was prepared by (i) weighing the TZ-3Y powder in the required amount to prepare a 60 wt% zirconia suspension, (ii) dispersing the TZ-3Y and dispersant powder (KD-1) in a binary solvent system of ethanol and methyl ethyl ketone with the ratio of EtOH/MEK : 34/66 wt% for 3h (dispersion step), (iii) introducing tape casting additives such as binder (B-98), plasticizer I (S-160), and plasticizer II (PEG 200), and (iv) ball milling the resulting mixture for 24h (thickening step). Finally, flixweed seeds were mixed, and dispersed using a mechanical stirrer to make the dispersion uniform for 15 min. The flixweed seeds were mixed and dispersed right after ball milling and before de-airing to prevent the breakage of the flixweed seeds during ball milling, and to take advantage of the presence of solvents that could help to dispersion of the seeds before de-airing. De-airing under a mechanical vacuum is necessary to remove the extra solvent and also to prevent the formation of air bubbles during the casting. A mechanical vacuum pump and a vacuum chamber were used to perform the de-airing during magnetic stirring. Upon de-airing, the mechanical stirring continued for further 5 min. to make the dispersion more uniform. The slurry cast at the thickness of 3000 μm, and the casting speed was 2 mm/s. The tape-cast dried for 48h, and the thickness of dried tape was 1000 μm. The tapecast was cut into 25 mm diameter disks, and fired at 1400°C for 2h, resulting in disks without visible cracks. Figure 2a shows a SEM image of flixweed seeds with typical oblong shape. Figure 2b shows a SEM image of flixweed seeds and the network texture on the surface. Table 1 presents the maximum Feret diameter (length), minimum Feret diameter (width) and aspect ratio of flixweed seeds obtained by image analysis software (Image J) that revealed the particle size distribution of flixweed seed is narrow. Table 2lists the density of ingredients used. The density of flixweed seed is required to calculate the volume percentage of pore-former in the system and it was determined by floating flixweed seeds in a sugar solution (saccharose). The addition of sugar to the water in which flixweed seeds had settled down continued until the flixweed seeds exhibited buoyancy. 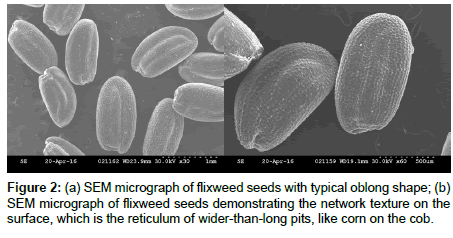 The measured density of flixweed seeds in this study is 1.14 ± 0.04 g/cm3. Figure 3 shows the SEM micrograph of the pores generated by burning out of flixweed seeds. As expected, the shape of the pores due to flixweed seed is oblong. The maximum Feret diameter, the minimum Feret diameter, and the aspect ratio of the pores derived from the burnout of flixweed seeds are 740 μm, 380 μm, and 1.9, respectively. Figure 4 shows the SEM micrograph of the pores generated by burning out of microcrystalline cellulose. 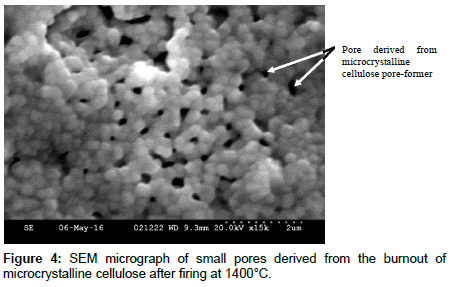 The pore diameter of the pores derived from the burnout of microcrystalline cellulose is 0.3 μm. Archimedes relations are used to calculate the bulk density (Db), and open porosity (Po) of composites. WD , WS and WI are the weight of dry, weight of saturation and weight of immersed in distilled water (Dwater = 1 g/cm,sup>3), respectively. Figure 1: Schematic representation of the porous zirconia fabrication using fixweed seeds by tape casting. Figure 2: (a) SEM micrography of fixweed seeds with typical oblong shape;(b) SEM micrography of fixweed seeds demonstrating the network texture on the surface, which is the reticulum of wider-than-long pits,like corn on the cob. Table 1: Size and shape characteristics of flixweed seeds (Feret diameters and aspect ratios determined by image analysis). Table 2:Densities of the ingredient used. Figure 3: SEM micrograph of large pores derived from the burnout of flixweed seeds after firing at 1400°C. Dth is the theoretical density of zirconia (TZ-3Y), i.e., 6.05 g/cm3. Table 3 summarizes the microstructural characteristics of fired porous zirconia ceramics with pores derived from microcrystalline cellulose and flixweed seeds. Microcrystalline cellulose and flixweed seeds were added to 165 g of the as-prepared zirconia suspension in the amounts of 5.2 and 1.2 g that according to the densities presented in Table 2 corresponds to a total pore-former volume of 28.1% on dry green tape basis. The total porosity of fabricated porous zirconia is 34.6% that is 6.5% higher than the pore-former content of dry green tape. This extra porosity must be a result of dispersant burnout (4.2 vol% on dry green tape basis) and also from the binder burnout (18.8 vol. % on dry green tape basis). Živcová et al. used traditional slip casting (TS) into plaster molds (cylindrical rods, diameter 5 mm) and starch consolidation casting (SC) using metal molds (cylindrical rods, diameter 7 mm) for the fabrication of porous alumina ceramics. In the starch consolidation casting (SC), starch can be used as pore-former and at the same time binder [14,25]. Commercially milled coffee, and poppy seeds are of potential interest due to their specific size. Table 4 compares the alumina ceramics prepared using commercially milled coffee, and poppy seeds, and the zirconia ceramics prepared using flixweed seeds as pore-former. The data for alumina ceramics prepared using potato starch is also presented because in alumina ceramics prepared using coffee and poppy seed by starch consolidation method potato starch performs as binder. Fabriation of the zirconia with hierarchical porosity using flixweed seed by tape casting has generated ceramics with the total porosity of about 35% that is in the same range compared to other methods and pore-formers. About 26% of the formed pores in the prepared porous zirconia are closed, but they are functional for uses such as acoustic and thermal insulation. The lamination of ceramic sheets prepared by tape casting and multi-layer tape casting provides the advantage of manufacturing ceramic sheets with gradual porosity. The controlled pore size and porosity enables the technique to fabricate ceramic multi-layers with different thermal conductivity in each layer. 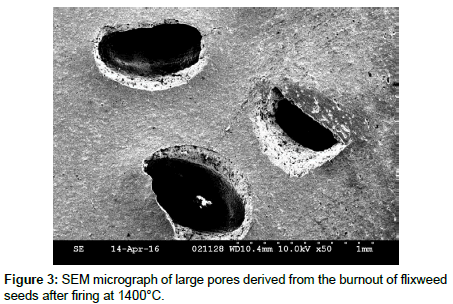 Figure 4: SEM micrograph of small pores derived from the burnout of microcrystalline cellulose after firing at 1400°C. Table 3: Microstructural characteristics of porous zirconia with large and small pores due to flixweed seeds and microcrystalline cellulose fired in 1400°C. Table 4: Alumina ceramics prepared using different pore-formers compared to the samples fabricated in this study. using flixweed seeds as pore-former. The data for alumina ceramics prepared using potato starch is also presented because in alumina ceramics prepared using coffee and poppy seed by starch consolidation method potato starch performs as binder. Fabriation of the zirconia with hierarchical porosity using flixweed seed by tape casting has generated ceramics with the total porosity of about 35% that is in the same range compared to other methods and pore-formers. About 26% of the formed pores in the prepared porous zirconia are closed, but they are functional for uses such as acoustic and thermal insulation. The lamination of ceramic sheets prepared by tape casting and multi-layer tape casting provides the advantage of manufacturing ceramic sheets with gradual porosity. The controlled pore size and porosity enables the technique to fabricate ceramic multi-layers with different thermal conductivity in each layer. In this study, it is shown that flixweed seeds are a potential poreformer for ceramic preparation. The defect-free burnout of flixweed seeds was feasible using a conventional firing profile. The density measurement revealed that the density of flixweed seed is a slightly higher than that of water. Therefore, not only for organic slurry formulations, but also for aqueous slurry formulations flixweed seeds are appropriate pore-former compared to many synthetic polymeric pore-formers that are exhibiting strong buoyancy effects at the same size. Among the main advantages for the use of flixweed seeds as a pore-former in ceramic technology are easy handling, defect-free burnout, lowcost, ready availability in the constant oblong shape with narrow size distribution and well-defined aspect ratio (about 2). Considering that the thermal barrier coating is one of the most important applications of zirconia-based ceramics , the compatibility of flixweed seeds with zirconia and its large size highlights the use of this natural pore-former. The SEM data were obtained at the SEM lab of the Characterization Facility of the Liquid Crystal Institute, Kent State University.The authors acknowledge the FMC BioPolymer, USA for providing microcrystalline cellulose (PH-301). Scheffler M, Colombo P (2006) Cellular ceramics: Structure, manufacturing, properties and applications. John Wiley & Sons, USA. Deng ZY, Yang JF, Beppu Y, Ando M, Ohji T (2002) Effect of agglomeration on mechanical properties of porous zirconia fabricated by partial sintering. Journal of the American Ceramic Society 85: 1961-1965. Chen X, Hong L (2010) An in situ approach to create porous ceramic membrane: Polymerization of acrylamide in a confined environment. Journal of the American Ceramic Society 93: 96-103. Larbot A, Fabre JP, Guizard C, Cot L (1988) Inorganic membranes obtained by sol-gel techniques. Journal of Membrane Science 39: 203-212. Gonzenbach UT, Studart AR, Tervoort E, Gauckler LJ (2007) Macroporousceramics from particle-stabilized wet foams. Journal of the American Ceramic Society 90: 16-22. Gregorová E, Pabst W, Bohacenko I (2006) Characterization of different starch types for their application in ceramic processing. Journal of the European Ceramic Society 26: 1301-1309. Horri BA, Selomulya C, Wang H (2012) Characteristics of Ni/YSZ ceramic anode prepared using carbon microspheres as a pore former. International Journal of Hydrogen Energy 37: 15311-15319. Panthi D, Choi B, Tsutsumi A (2012) Performance enhancement of strontium-doped lanthanum manganite cathode by developing a highly porous microstructure. Journal of Applied Electrochemistry 42: 953-959. Sarikaya A, Dogan F (2013) Effect of various pore formers on the microstructural development of tape-cast porous ceramics. Ceramics International 39: 403-413. Suzuki T, Yamaguchi T, Hamamoto K, Sumia H, Fujishiroa Y (2011) Low temperature densification process of solid-oxide fuel cell electrolyte controlled by anode support shrinkage. Rsc Advances 1: 911-916. Bose S, Das C (2015) Sawdust: from wood waste to pore-former in the fabrication of ceramic membrane. Ceramics International 41: 4070-4079. Boaro M, Vohs JM, Gorte RJ (2003) Synthesis of highly porous yttria-stabilized zirconia by tape-casting methods. Journal of the American Ceramic Society 86: 395-400. Simwonis D, Naoumidis A, Dias FJ, Linke J, Moropoulou A (1997) Material characterization in support of the development of an anode substrate for solid oxide fuel cells. Journal of Materials Research 12: 1508-1518. Gregorová E, Pabst W (2007) Porous ceramics prepared using poppy seed as a pore-forming agent. Ceramics international 33: 1385-1388. Sarikaya A, Petrovsky V, Dogan F (2012) Effect of the anode microstructure on the enhanced performance of solid oxide fuel cells. International Journal of Hydrogen Energy 37: 11370-11377. Tang F, Fudouzi H, Uchikoshi T, Sakka Y (2004) Preparation of porous materials with controlled pore size and porosity. Journal of the European Ceramic Society 24: 341-344. Hu J, Lü Z, Chen K, Huang X, Ai N, et al. (2008) Effect of composite pore-former on the fabrication and performance of anode-supported membranes for SOFCs. Journal of Membrane Science 318: 445-451. Kim M, Lee J, Han JH (2011) Fabrication of anode support for solid oxide fuel cell using zirconium hydroxide as a pore former. Journal of Power Sources 196: 2475-2482. Pan WP,Lü Z, Chen KF, Zhu XB, Huang XQ, et al. (2011) Paper-fibres used as a pore-former for anode substrate of solid oxide fuel cell. Fuel Cells 11: 172-177. Liu R, Wang C (2013) Effects of mono-dispersed PMMA micro-balls as pore-forming agent on the properties of porous YSZ ceramics. Journal of the European Ceramic Society 33: 1859-1865. Nimrouzi M, Sadeghpour O, Imanieh MH, Ardekani MS, Salehi A, et al. (2015) Flixweed vs. polyethylene glycol in the treatment of childhood functional constipation: a randomized clinical trial. Iranian Journal of paediatrics 25: e425. Li W, Liu X, Khan MA, Kamiya Y, Yamaguchi S (2005) Hormonal and environmental regulation of seed germination in flixweed (Descurainiasohia). Plant growth regulation 45: 199-207. Amin G (1990) Traditional herbal drugs in Iran. Iranian ministry of health publications, Tehran. Calahorra M, Cortázar M, Eguiazábal JI, GuzmánGM (1989) Thermogravimetric analysis of cellulose: effect of the molecular weight on thermal decomposition. Journal of Applied Polymer Science 37: 3305-3314. Živcová Z, Gregorová E, Pabst W (2008) Alumina ceramics prepared with new pore-forming agents. Processing and Application of Ceramics 2: 1-8. Loganathan A, Gandhi AS (2012) Effect of phase transformations on the fracture toughness of t'yttria stabilized zirconia. Materials Science and Engineering: A 556: 927-935.